One of the best parts of being in Paris was seeing my friend Lucile again! Having an overseas friend is a lovely thing but it makes getting together a little bit difficult. Lucile paints gorgeous watercolours and sells them under the name lucileskitchen. (You can follow her on Instagram if you are interested in seeing more of her work.) We became internet friends in 2011 when I was in the process of opening my Etsy shop. I contacted her because I love her art so much and I had some questions about how she did her prints. We soon learned that we had lots in common--watercolour art, teenaged children, a love of cooking and gardening, a sense of humour (absolutely essential to artistic sanity) and an interest in each other's world. We are in touch with each other on a regular basis to discuss art, Etsy, Boucherville snow, Paris rain, flowers, food, our children and Meeko! We met each other in person in 2012. We were very lucky (well, actually it was planned) to vacation in New York City at the same time. Because we were there on family vacations, our time together was brief but very enjoyable. We visited the Ellsworth Kelly plant drawings exhibit together at the Metropolitan Museum of Art. Our families had dinner together at one of Mario Batali's restaurants. 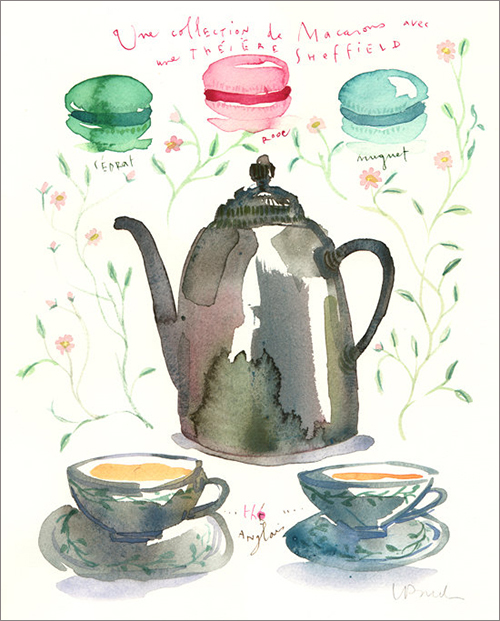 I own three of Lucile's original paintings, one of which is this lovely watercolour of macarons, a Sheffield's teapot and tea cups. It hangs in our dining room. Lucile and I have often mentioned how nice it would be to have tea together someday. Well, we finally did! Best of all, it was in her lovely Paris apartment! She invited my husband and me for 'un gouter'--a delicious snack at her place. I was so grateful that she was able to squeeze in some time to see us. Lucile is currently working on a crazy schedule--doing three paintings a day (three!!!) for a recipe book contract that is due in May. 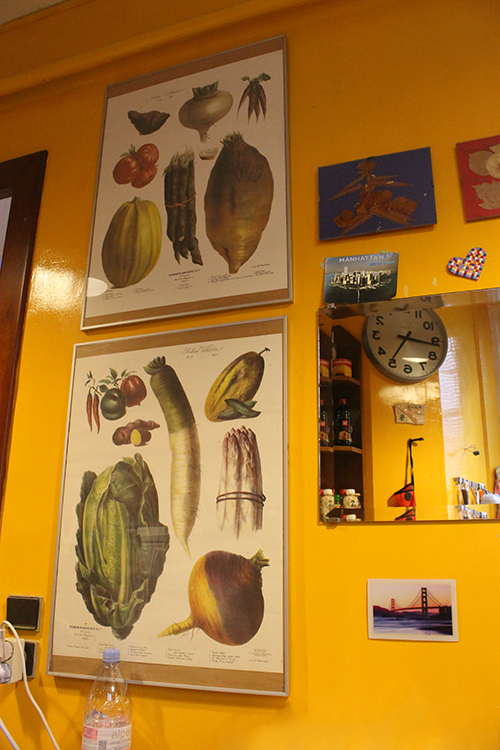 I completely adore Lucile's small, warm Parisian kitchen with its big personality. I love that it is painted with a strong yellow. Although not exactly the same yellow, it reminded me of Monet's boldly painted kitchen at Giverny. I also love the historical Vilmorin vegetable plates on the walls. 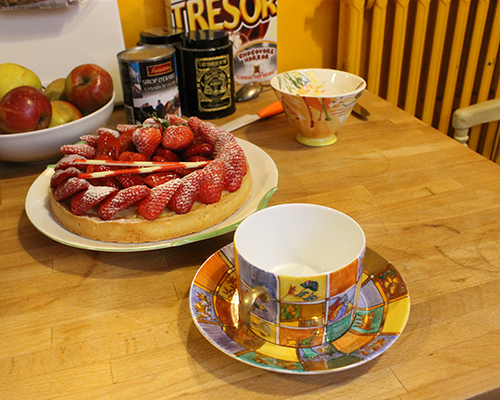 Lucile bought a gorgeous strawberry tart from a local pâtissier to share with us and her children Jeanne and Werner. She poured tea. We ate. We chatted. It felt like we did this all the time. 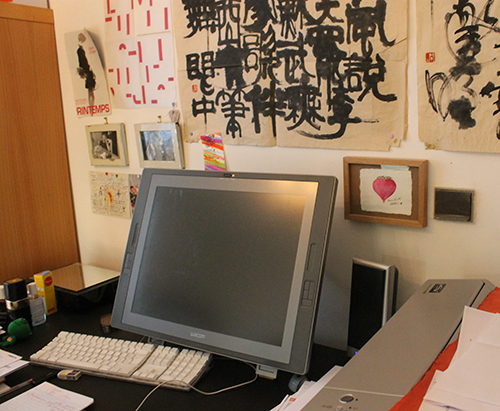 Just before leaving, we had a peek at Lucile's studio. I had glimpsed it previously in an Etsy blog post on inspiring workspaces. It was so lovely to see it in person. I was very touched to see that a little heart watercolour I did for Lucile as a thank you for her help a few years ago was framed on the wall beside her Wacom Cintiq tablet. 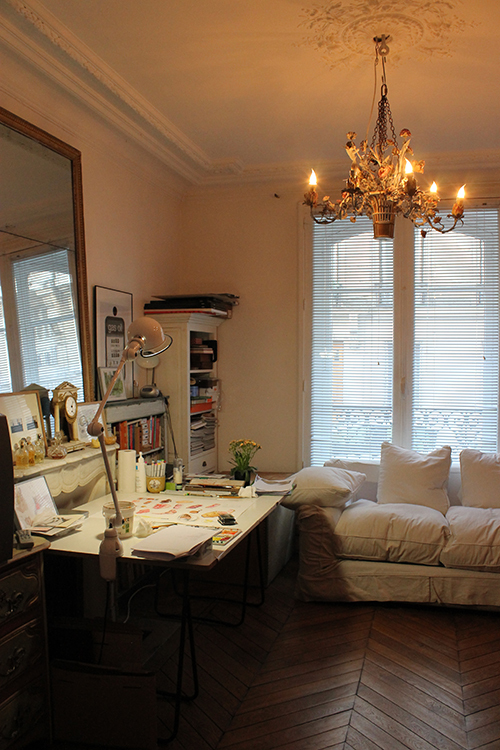 Her softly lit studio had an almost magical quality for me, with its high detailed ceiling, the beautiful chandelier that belonged to her grandmother, the tall window and the painting she had worked on that day drying on the table. I love that now when Lucile tells me that she is working on a painting or cooking dinner that I will be able to picture her exactly where she is. Sending a big anglophone hug across the ocean, Lucile. Until next time, my friend! This was so lovely Kathleen. It felt like you took me with you on your visit to your friends beautiful home. How wonderful for you both to have met and become friends. Paris has always held a magical quality for me and your blog on your trip there has made it seem even more so. Thanks, Sandy! It was nice to be able to share this special part of my trip. Enjoyable to read about you meeting. Must have been geat to see eachother in reall life! Thanks, Catharina. It really was nice to see Lucile again. I loved seeing her studio too.